Ashraf Fayadh is a Palestinian poet, artist, and curator living in Saudi Arabia, who was sentenced to eight years in prison and 800 lashes on charges of apostasy on February 2, 2016. He was initially sentenced to death in 2015. Fayadh was first arrested in 2013 on accusations stemming from his poetry collection Instructions Within and an alleged personal altercation with a man who reported him to Saudi religious authorities. Fayadh was originally arrested in August 2013 following an argument with a man in the southwestern city of Abha in Saudi Arabia, where Fayadh resided. The man reported him to Saudi Arabia’s religious authorities and he was arrested, but released shortly after. 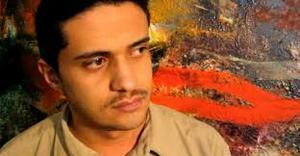 On January 1, 2014, Fayadh was rearrested on charges of apostasy and having illicit relations with women. The charge of apostasy was based on testimony from the man from the argument in 2013 and from two officers from the religious police that had arrested him. The individuals also pointed to supposed atheistic and blasphemous themes in his poetry collection Instructions Within, published in 2008. These poems are ruminations about Fayadh’s life as a Palestinian refugee, as well as cultural and philosophical issues. The charges of illicit relations with women stem from photographs on Fayadh’s phone of him pictured with women, but individuals who attended one of Fayadh’s exhibits have repeatedly stated that the women are fellow artists and friends of Fayadh. Fayadh’s supporters also believe he is being punished by Saudi authorities because he posted a video online showing religious police publicly lashing a man. There are concerns that he is being targeted because of his status as a Palestinian refugee as well, although he was born in Saudi Arabia. Fayadh was born into a stateless family of Palestinian origin, and his only identification documents are issued by the government of Egypt. The judicial proceedings against Fayadh have lacked any semblance of due process. Saudi police confiscated his identification documents after his arrest in January 2014, then denied him legal representation because he did not possess proper identification. The court case against him has dragged on for two years, and on November 17, 2015, he was found guilty of both charges and sentenced to death by beheading for the charge of apostasy. Fayadh’s father suffered a fatal stroke after learning of the death sentence punishment. Fayadh’s lawyers appealed the death sentence, and in February 2016 the sentence was changed to eight years in prison and 800 lashes. Fayadh has worked throughout the years to serve as an unofficial ambassador for the small contemporary art scene in Saudi Arabia. He is involved with the art platform Edge of Arabia, which facilitates collaboration between Middle Eastern and Western countries. In 2013, he organized an exhibit, Mostly Visible, in the Saudi city of Jeddah. He co-curated the exhibit Rhizoma as part of Edge of Arabia’s exhibition in 2013 at the Venice Biennale. On December 2, 2015, Fayadh became an honorary member of German PEN.